Leslie Perera Ja-Ela Central Corr. Archbishop of Colombo, Cardinal Malcolm Ranjith with schoolchildren at the protest against drugs, in Tudella, yesterday. Today, children are in danger of falling easy prey to the widespread drug menace, said Archbishop of Colombo, Cardinal Malcolm Ranjith, at the launch of a protest against drug peddling and drug addiction, at St. Mary’s Church, Tudella, yesterday. 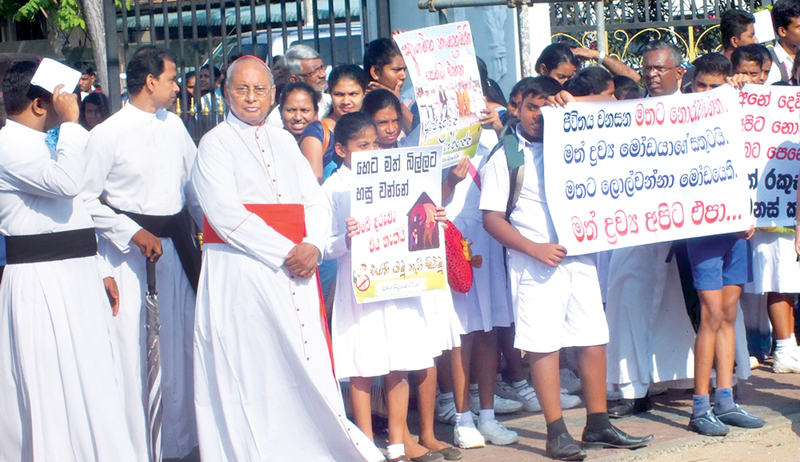 Cardinal Ranjith led schoolchildren in protest along the Colombo - Katunayake Road. While the children carried placards to protest the drug menace, no slogans were uttered. During his homily to the faithful at the Holy Mass preceding the protest demonstration, he said children are the most valuable gift from God, and it is the duty of parents to protect them. Parents should be vigilant about what children do and where they go. Sri Lanka is in a precarious position due to the widespread drug menace, as drug peddlers carry on regardless of the adverse effect on children. Drug traffickers must keep in mind that they would be subject to God’s wrath for their crime of destroying children, he said. Parents of the children also participated in the protest.